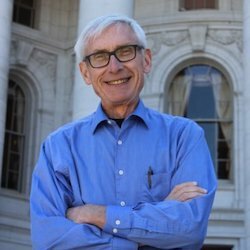 Washington, D.C., April 8 – During the 2019 National Governors’ Association winter meeting, newly elected Wisconsin Governor Tony Evers said that “education is the most important issue in Wisconsin” and pledged a $1.4 billion dollar investment in his state’s schools. Out of that investment, Gov. Evers pledged a “600 million dollar increase” for students with disabilities. That is good news for Wisconsinites with disabilities. The newly published 2018 Annual Disability Statistics Compendium shows that there are 339,267 working-age (18-64) people with disabilities living in Wisconsin. Out of that number, 142,285 have jobs. That means that the Badger State has a 41.9 percent disability employment rate. Further analysis by the nonpartisan advocacy group RespectAbility shows that Wisconsin ranks 17th in the nation out of the 50 states for disability employment. Census Bureau data also shows that more than 1,441 people with disabilities left Wisconsin’s workforce last year. The state of Wisconsin also offers a range of innovative programs to give that “extra lift” to get more people with disabilities into the workforce. One key example of this has been the Wisconsin PROMISE program that offers youth with disabilities job, benefits and financial counseling. The 2,000 individuals participating in the program hold twice as many jobs that last longer and have more hours than those individuals served by rehabilitation services not participating in the program. Beyond PROMISE, Project SEARCH is another major component of Wisconsin’s commitment to workforce development solutions for youth with disabilities. Project SEARCH is a program that empowers young people with intellectual and developmental disabilities to successfully transition from the classroom into the workforce. Without this type of support, young people with disabilities face incredible challenges entering the workforce and earning an income. In 2013, Wisconsin was home to only three such programs, serving only around 36 youth with intellectual and developmental disabilities each school year. In 2015, Project SEARCH in Wisconsin added 14 new sites, now serving approximately 140 youth each year. Because of the Blueprint for Prosperity Initiative, launched by in 2014, Wisconsin soon will host a total of 27 sites, serving more than 300 youth with disabilities annually.